click photo to enlarge This is Cabo San Lucas Bay on the sea of Cortez side. This picture is taken from atop the highest point around. We had rented a quad and found a steep winding dirt road to the top. The views were fabulous. 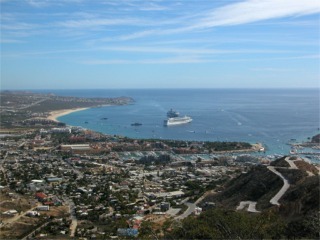 The city of Cabo San Lucas (just called Cabo) is below. Cabo is very Americanized. Much more so then any of the other ports we stopped at. It is also a lot more expensive. You can expect prices to be the same as or higher then in the US. Just about anything you could want to do is available here. click photo to enlarge This is a view of the other direction on the same hilltop. This is the Pacific side of the peninsula. As you can see from the picture and the cactus this is desert. 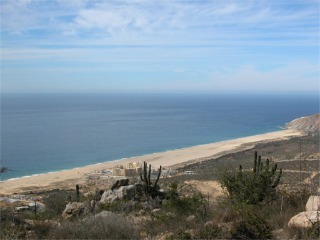 Cabo is at the end of the Baja Peninsula. 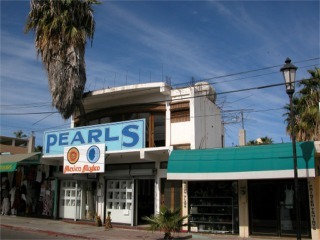 Cabo is world-renowned for it's sport fishing and it was tempting. We drove around on the quad for a while, then turned it in, and went walking through the shops and had lunch. We could have gone back to the ship for lunch but it is enjoyable to sit and take in the local scene. 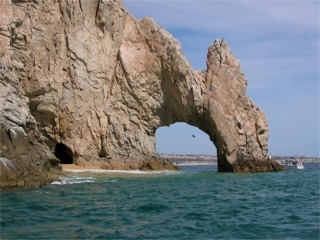 click photo to enlarge Cabo's most famous landmark is El Arco. You have to take the water taxi ride out to see the arch and Lovers Beach. The water taxi drivers really go out of their way to maneuver you all around the arch, through the arch and other points of interest. There were many other water taxis around too. They want to get you the best view so you will tip more<grin>. 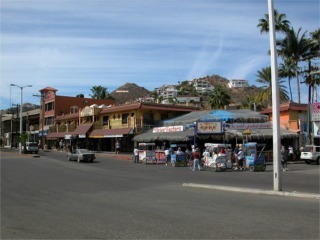 click photo to enlarge This is a street scene in Cabo, it is wide, and clean. Later in the day it got more crowded. click photo to enlarge One of the things we have always found interesting in Mexico is rebar coming out of buildings. It seems, if there is rebar still coming out, the building can be considered still "under construction" and taxes are lower.